Known for its breathtaking views and sparkling waterfront, the town of Tiburon is starting to see its real estate market rebound after a slow couple of years. “Until recently nobody was selling unless they had to, and the people in Tiburon and Belvedere were historically people who, if they didn’t get their price, they would just take their property off the market or rent it,” said Brent Thomson, a senior vice president at Pacific Union International and branch executive for our Marin County region. Between January and July, the number of single-family homes sold in Tiburon increased 43 percent over the same period in 2011, growing from 51 to 73 homes, according to MLS data. The average sales price is now $1.65 million. At the same time, city officials are launching a new marketing campaign to re-brand the town and attract more tourists to the scenic southern Marin County locale. Recently, one home went under contract just six hours after going on the market, and multiple offers have become the norm, she said. 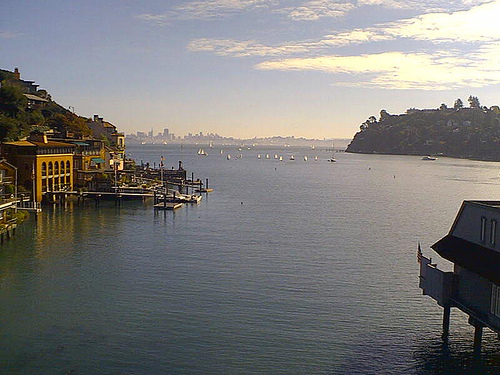 With a population of about 9,000, Tiburon lies between Corte Madera and Mill Valley on the Tiburon Peninsula. The town is affluent, with a median household income of $147,232, according to the 2010 U.S. Census. More than 80 percent of residents 25 or older have at least a bachelor’s degree. Tiburon has become increasingly attractive to young families, in part because of its excellent Reed Union School District, said Mayor Jim Fraser, who also works as a Pacific Union real estate professional. All three district schools have earned the prestigious California Distinguished School award. Tiburon boasts a ferry terminal, a revitalized downtown, and the Boardwalk and Cove shopping centers. Outdoor enthusiasts have many options for jogging, walking, and cycling on waterfront trails, and the remodeled Belvedere-Tiburon Library offers programming and activities for children and adults. Blackie’s Pasture, named for a well-known local horse that died in the 1960s, offers a charming bit of history and remains popular among dog walkers and hikers. Tiburon is home to a variety of neighborhoods, including the Old Tiburon neighborhood with its hillside views of San Francisco, Angel Island, and the Golden Gate Bridge; the Bel Aire and Belveron neighborhoods with easy access to schools and Highway 101; and the Shoreline Park area with great proximity to the waterfront.